This plant is located northwest of Philadelphia, about 21 miles. It has 2 reactors which are a hazard should an earthquake occur, the likelihood of which is 3.5 out of 10. The population that could potentially suffer within a 50-mile radius from it is almost 8 million people. The United States Nuclear Regulatory Commission has done some research about nuclear power plants in the US, and has determined the most dangerous nuclear power plants there are if an earthquake were to occur. Every year, the Commission has calculated, the chance of a typical nuclear reactor being damage by an earthquake (resulting in radiation exposure for the public) is 1 in 74,176. Scarily, this is 10 times more likely than winning the lottery (even as little as $10,000), where the odds would be 1 in 723,145. So, what has the Commission found about nuclear power plants in the US? Surprisingly, those along the California coastline, considered the prime earthquake-prone zone, are NOT considered the most dangerous nuclear power plants (except for one). This is because these plants were built to be able to withstand a serious quake if need be. In general, the Commission found it difficult to precisely rank the safety levels of each plant, since there are too many variables to consider. 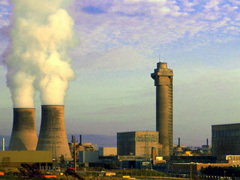 However, it came up with a comprehensive list (taking all risks into consideration) of the most dangerous power plants. Here are 5 of these plants. 1 - Indian Point nuclear power plant, NY.